Crows rock at making complex tools: Study – FIREPAW, Inc. 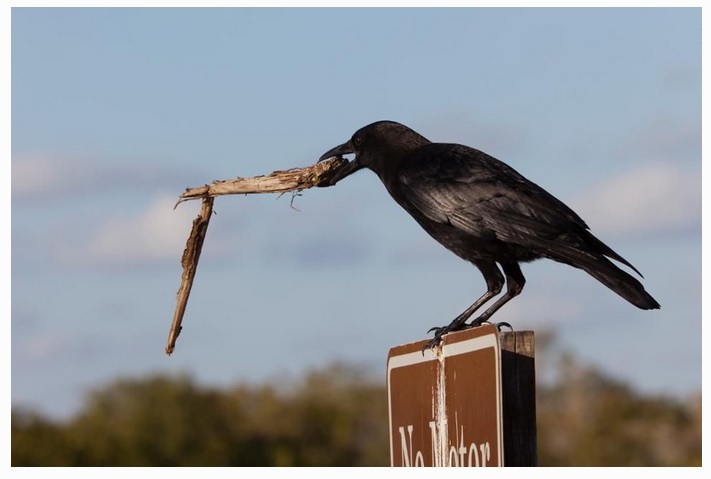 Here is your daily proof that animals are much cleverer than scientists used to think: crows have figured out to build a long stick by slotting together smaller sticks, in order to reach an inaccessible piece of food. Researcher presented eight New Caledonian crows with a box containing a piece of food. But the food was behind a door, which left only a narrow gap at the bottom. The food was too far inside the box for the crows to reach in with their beaks. The team also gave the crows sticks, which were designed to join up: one was hollow, for another stick to be slotted inside. Four of the eight crows figured this out, built a long stick and retrieved the food. One of them went further and made sticks from up to four pieces. The new study shows that these birds can create long-reaching tools out of short combinable parts — an astonishing mental feat. Assemblage of different components into novel functional and maneuverable tools has, until now, only been observed in apes, and anthropologists regard early human compound tool manufacture as a significant step in brain evolution. Children take several years before creating novel tools, probably because it requires anticipating properties of yet unseen objects. Such anticipation, or planning, is usually interpreted as involving creative mental modelling and executive functions. Read more about this study and other studies demonstrating how intelligent crows and other nonhuman animals are here and here. Previous Yes, your pet can tell time!